Race to 100 is inspired by the game Poison! Race to 100 from Love 2 Learn 2 Day! Kids get a 100 grid. Ones and tens pieces remain in between the 2 players. Kids take turns rolling 2 dice, the special place value die and a regular die. The regular die determines how many ones or tens they get. For example, a kid might roll a 3 and the place value die lands on tens. The player takes 3 tens and covers his board. If the place value die lands on lose turn, the player loses his turn! :( If it lands on start over, the player must clear his board and start over! :( The goal is to be the first to cover the 100 board! Players can't go over or be slightly under 100. They have to make exactly 100! You can print the die and 100 grid here. 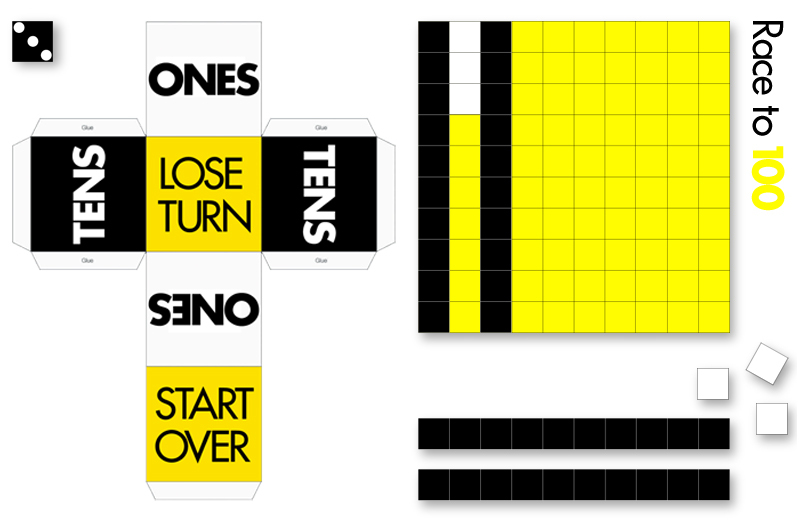 For the ones and tens, print extra copies of the 100 grid and cut apart to create the playing pieces. For a colorful game, print on different colors of cardstock paper. This game sounds brilliant! Thanks for sharing. Please could you check the link to the printable as it doesn't seem to work. The link wasn't right! Thanks for letting me know!